I may be the only person out there with the particular set of circumstances that created this problem, but I’m going to share my solution anyway. 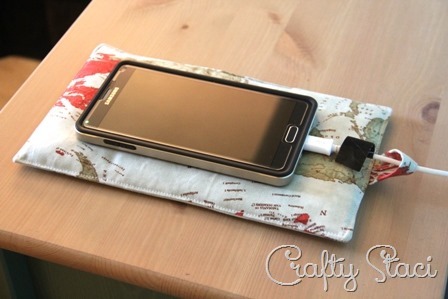 It’s a unique, easy to make gift that anyone with a phone could probably use, even if it’s not for the same reasons I created it in the first place. About that, let me tell you the story. Last summer, I decided it was time to get healthier. My husband and I started eating better and walking regularly, and I bought a watch that would count my steps and link to my phone. One of my favorite features was that I could set an alarm to wake me up and it would vibrate gently on my wrist. It’s much nicer than a buzzing alarm clock and wakes me up every time. The problem was, I charged my phone in the office, and it was far enough away that it would disconnect from my watch and the alarm wouldn’t go off. Wondering if your alarm is going to work does not make for restful sleep. So, I moved my phone into my bedroom. The issue there was that I could turn the ringer off, but when the alarm sounded the phone would vibrate – on my wooden bedside table. It sounded like a train driving through, and was a terrible way to wake up. Problem number three was the cord. Whenever I would unplug it from my phone, it would slither down behind the table, where I would have to retrieve it every night. That got old fast. I managed to solve all of these problems with a quick project that actually looks good next to my bed. My phone is close enough it doesn’t disconnect from my watch, it doesn’t wake me with sounds that make me run for cover, and I never lose that cord! 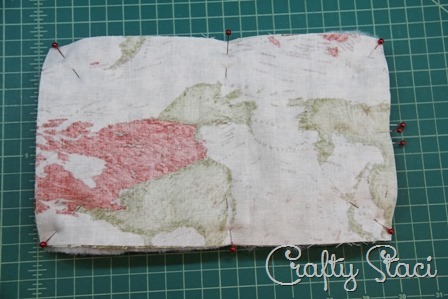 To make this, all you’ll need is fabric and some sort of batting or fleece. You could even use some leftover Insul-Bright. Cut two fabric rectangles 6 x 10”, one 2 x 3” and one batting 6 x 10”. You can adjust the sizes if your phone is smaller, or you’d like to make it larger to accommodate a tablet. 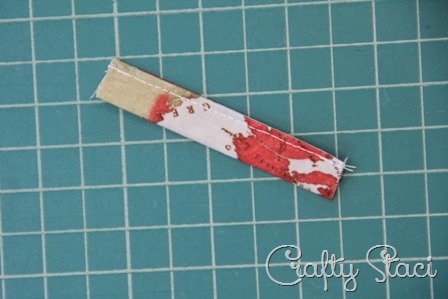 Fold the small rectangle in half lengthwise, then fold the two edges into the middle. Press. Stitch close to the edge with the two folds. Lay the batting on your work surface. Add the fabric on top, right side up. Pin the loop in place in the middle of one short end, making sure the pin heads stick out the side so they can be removed as you sew. Lay the other piece on top, right side down. Pin in place. 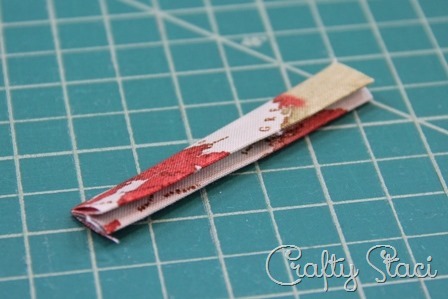 Stitch around, 1/4” from the edge, leaving 2 1/2 – 3” open on one side for turning. Clip the corners and turn right side out. Press, turning in the opening. 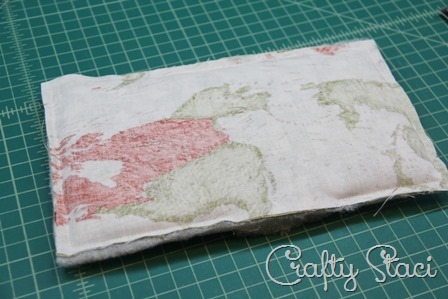 This would be a great gift for a kid who’s learning to sew to make for Dad, Mom, a teacher or a sibling. I’ll just be over here, enjoying the quiet.